SR 512 Eastbound - Road work on SR 512 eastbound at milepost 4.2 near Waller Rd E beginning at 2:58 am on April 19, 2019 until about 4:30 am. I-5 Northbound - Road work on I-5 northbound from milepost 121.9 near Lakewood South City Limits to milepost 122.7 near Berkeley St SW beginning at 12:11 am on April 19, 2019 until about 4:00 am. I-5 Southbound - Road work on I-5 southbound from milepost 123.6 near Thorne Lane SW to milepost 122.7 near Berkeley St SW beginning at 10:07 pm on April 18, 2019 until about 4:00 am on April 19, 2019. The off ramp to Berkeley is closed. SR 16 Westbound - Road work on SR 16 westbound from milepost 1.1 near S Union Ave to milepost 1.8 near Center St Fly-Over beginning at 11:14 pm on April 18, 2019 until about 5:00 am on April 19, 2019. 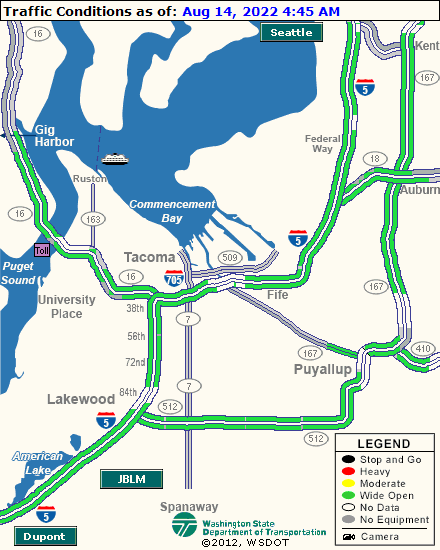 I-5 Southbound - Road work on I-5 southbound from milepost 135.05 near E Bay St/SR 167 to milepost 134.6 near East "L" St beginning at 9:01 pm on April 18, 2019 until about 6:00 am on April 19, 2019.